Verti-Lift upenders with V-cradle design are ideal for ergonomic positioning rolls of steel, paper rolls, coils or spools, tubular tanks, and other cylindrical products. 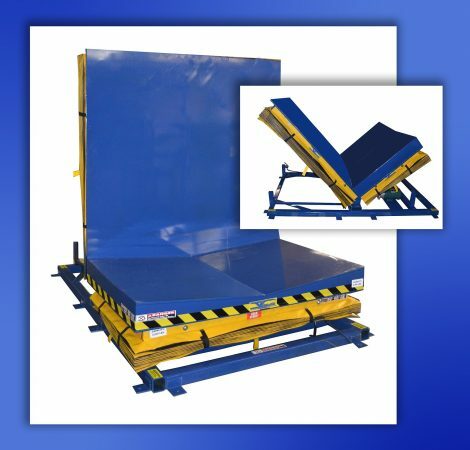 With a 6,000-pound capacity, these ergonomic positioning devices have enough power to re-position heavy loads, while the v-cradle keeps the load intact during movement. All Verti-Lift Hydraulic Upenders feature 0-90 degree tilt angle, hold-down tabs on all four corners, heavy duty cylinders for maximum service life, a/c 110 volt, single phase motor with 15-amp draw, and standard hand controls for lowering/raising tilt. Optional accessories include foot control, oversized platforms to suit specific material handling requirements, roller conveyors, accordion skirts, remote power units and PLC control. In addition to coil and roll handling, Verti-Lift Hydraulic Upenders are ideal for the safe and re-positioning of pallets loads and odd shaped objects. Video demonstrations of Verti-Lift products can be seen on YouTube (search Verti Lift). They are made in the U.S. and available from Material Handling Distributors nationwide.